It’s early morning at Camberwell Sunday Market and in a few hours the mercury will reach 40°c. The stall-holders know it. Some are blessed with shade from the trees, others have gazebos and the less fortunate have hats and are planning to wrap up early. 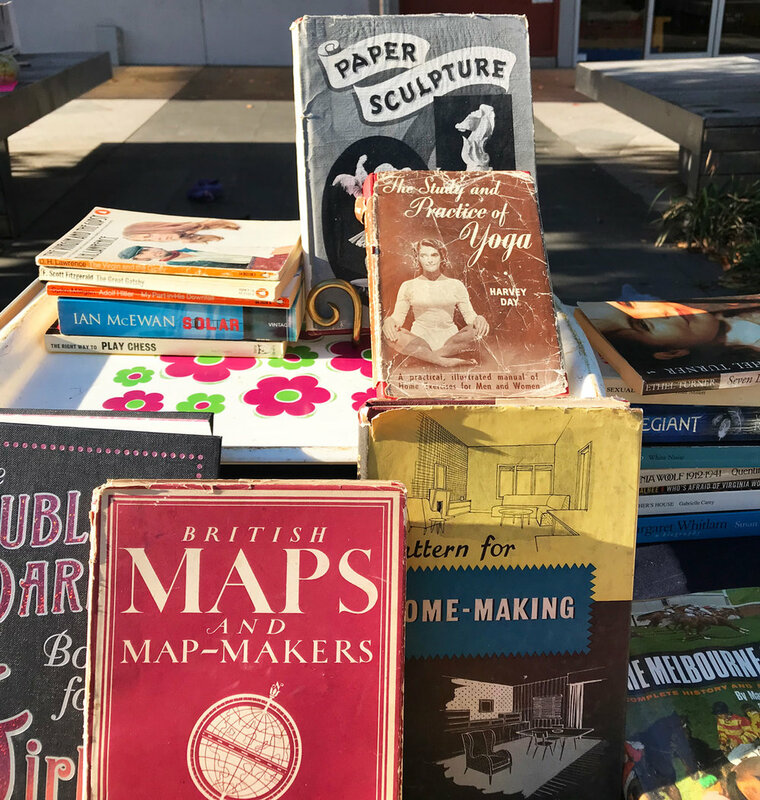 A bookseller we spoke to said today’s stall-holders were, ‘the new ones or the mad ones’. She was a mad one, an ‘irregular regular’ releasing her pre-loved books back into the wild. She was particularly fond of a blue covered book, ‘The Music and History of the Barque Trumpet before 1721’. For wheelchair users, the routes through the car park are wide and the stalls are easy to access. Some are horseshoe shaped others are square fronted. We got around the whole market but stopped regularly, the incline going south to north can be tough going. Give yourself time to slowly navigate the rise, bring a friend or some power assist (eg. Smart Drive). You could also consider skipping the return incline – starting at the north-east corner and finishing at the south west. Some say the market has changed the visitors, others say the visitors have changed the market. “We’ve gone from having $250 tea sets to $8 vintage earrings. It’s easier to sell impulse buys”. This regular couple had adapted their stall offering for volume over price. Another stall was working the other way, only stocking a few dozen high quality finds. You can’t say it’s not diverse. Ellen is a fledgling illustrator getting exposure & her design practise off the ground. She has sublime hand drawn calendars, cards and prints. A gentleman a few stalls across specialises in ceramics and glassware. Another stall has only banknotes and coins. Another wooden Japanese ornaments & furniture. More than a few stalls are couples cleaning out a bulging wardrobe. Then there’s the flea market stalls. The ones that are somehow the most interesting. Often, they look like someone has emptied an old box from a forgotten shed onto the trestle. Pocket knives, dice, bottle tops, 3 forks, a tea pot, tobacco tins, matchbox cars you name it. We love this stuff, it’s 100% pure nostalgia. Camberwell market is on every Sunday (except the one before Christmas) and entry is a gold coin donation. Spend a few hours browsing and take home a souvenir with a story or something fabulous to wear. If you don’t really need anything come and discover the most interesting, obsessive and friendly people you’re likely to meet. It’s also the cheapest place in Melbourne for a toasted-cheese sandwich. Cash only. Good: You won’t leave empty-handed. Not so: The incline can be work.